Also, I found a wonderful new website called Glam-o-Mamas, brainchild of VJ, model and stylish young mom, Amanda Griffin who also happens to be a Human Nature user. In fact she likes them so much, she's giving the Citronella Bug Spray and Citrus Burst Sanitizers as gifts! Even more wonderful for us was the MOA signing between Human Nature, Gawad Kalinga, PFEC and KMMBK which took place in Labo, Camarines Norte last week. Our vision of an abundant country full of prosperous farming communities is a step closer and you can read the details below. We're already working on the next few communities that will benefit from Human Nature... more details to follow in future newsletters. Lastly, we've got a number of exciting new products coming at the end of this month like our all natural "Velvet Passion Mineral Eyeshadow" with Passion Fruit oil. It will come in very wearable neutral colors to suit every skin tone. We will also be launching a yummy new kids' scent for our spray sanitizer and more goodies towards the end of March. Watch this space! Read on for more exciting updates on our products and advocacies. 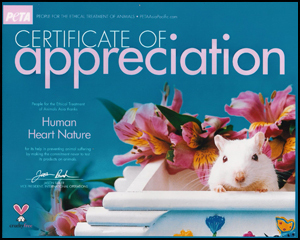 Human Nature is proud to announce that PETA Asia-Pacific, an affiliate of PETA USA, the world's largest animal rights organization, has recently awarded us with a certificate of appreciation thanking us for our support in preventing animal suffering by not testing our products on animals and for not incorporating carmine in our cosmetics line. PETA is the largest animal rights organization in the world with more than 2 million members and supporters, mostly in the USA and Europe. PETA focuses its attention on the four areas in which the largest number of animals suffer the most intensely for the longest periods of time: on factory farms, in the clothing trade, in laboratories, and in the entertainment industry. They also work on a variety of other issues, including the cruel killing of beavers, birds and other "pests" as well as cruelty to domesticated animals. PETA works through public education, cruelty investigations, research, animal rescue, legislation, special events, celebrity involvement and protest campaigns. PETA has also added Human Nature to its Caring Consumer Program, Cruelty-Free Shopping Guide, online cruelty-free company lists, and the iPhone application "Be Nice to Bunnies." 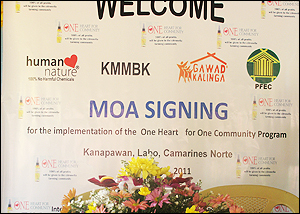 Almost 2 years since our first supply of Citronella Oil arrived from the hills of Kanapawan, Human Nature has formalized its programs for the pilot site of One Heart for One Community with a MOA signing last February 24, 2011 at the Kanapawan Elementary School in Labo, Camarines Norte. The whole community of Barangay Kanapawan greeted guests from Human Nature and Gawad Kalinga with much excitement as they were eager to hear the development program of Gawad Kalinga and meet the owner of the social enterprise which supported them through countless challenges the past 2 years. True to the spirit of GK of engaging communities through a multi-sectoral approach, the event was attended by representatives from the LGU, DepEd and Barangay who were all eager to join the work started by PFEC and KMMBK. Tito Tony Meloto sought to join the landmark event despite a hectic schedule to share the good news of government leaders and agencies allotting more land for GK's development model. 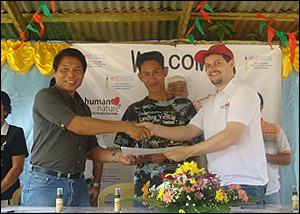 He challenged the community of Kanapawan to grow their own version of GK Enchanted Farms. Dylan shared Human nature's primary mission of bringing back dignity to the farmers and how the company is trying to live out the value of Walang Iwanan in its unwavering commitment to farming cooperatives, despite a competitive business environment. Lastly, Dr. Roger Guzman, Executive Director of PFEC, capped off the event by sharing the dream they had for the community 12 years ago and how the Citronella enterprise is now making it all come true. Months of discussions with KMMBK farmers, PFEC field workers, GK community organizers and Human Nature's Social Enterprise Development team have led to the final list of projects to be implemented by all stakeholders of the One Heart for One Community program. Starting this March, KMMBK farmers will enjoy PhilHealth coverage, Red Cross Insurance and upgrades & repair of their existing Citronella Oil Extraction facilities. Over the summer, GK Engineers will visit Kanapawan to build a GK office that will serve as a trading post for KMMBK products, and to repair & upgrade their elementary school classrooms that can be transformed into a community multi-purpose hall. Finally, children of Kanapawan elementary school will enjoy the benefit of having their own textbooks and school supplies when school opens the next school year. All of these benefits is just a start to the countless other community targets they can achieve through continued production of organic citronella oil. The relationship between KMMBK farmers, PFEC and Human Nature is an inspiring story of how Gawad Kalinga truly changes lives. Human Nature will strive to duplicate this success by developing 10 community farms all over the country for 2011. We would like to thank you for your dedication to the advocacy which made One Heart for One Community possible. With your continued perseverance, the lives of more Filipino farmers will improve which will benefit the entire nation. For many of our provincial dealers who are too far away to join this visit, please check with your nearest branch if they have a schedule for a visit to a Gawad Kalinga village which you can participate in instead. Human Nature branch operators from the different parts of the Philippines gathered together last February 2-3 for the Human Nature Branch Operators annual planning session. Amidst the 2010 updates and the many things to look forward to in 2011, the high point of the gathering was the visit made to Payatas Trese enterprise in GK Payatas and to the GK Enchanted Farm. Payatas Trese is the community enterprise that supplies our Human Nature merchandise (T-shirts, toiletry bags, tote bags, etc) as well as other corporate giveaways that utilize silkscreen printing. We listened to the stories of the men, women & youth behind the enterprise on how they began and the challenges they encountered as they push themselves to product top-quality items. I recall how proud they were of what they have accomplished and how empowered they were in being able to provide for their families because of the livelihood Payatas Trese and Human nature had given to them. While at GK Payatas, we learned of their need for additional sewing machines. Right there and then, driven by the inspiration from the community, the branch operators pooled enough resources amongst themselves to cover the full costs of two high-speed sewing machines and part of the costs of an edging machine. 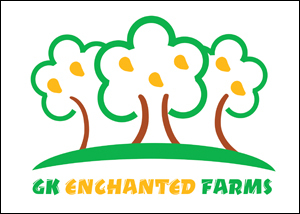 The visit to the GK Enchanted Farm capped the planning session. Once more, we experienced GK hospitality as the GK residents treated us to refreshing Enchantea, some bulacan delicacies and a hearty dinner. We witnessed how much progress had been made in the place and the promise of GK Enchanted Farm as a destination for social tourism and as a showcase for bridging the gap between the business sector and communities. The two days left us with lots of good memories and lessons not only about the business but also on how to fully imbibe the Human Nature advocacy in our lives and that I think is the most important. It's your last chance to grab your favorite face care products at never-before, never again prices before they're gone forever! Take your pick from the specials below! Special Offer 1: Superb Solo Savings! * Regular Dealer discounts apply. Special Offer 2: Free Facial Wash of Your Choice! Buy any 2 Hydrating Facial Wash 50ml or Balancing Facial Wash 50ml or a combination of both and get your choice of facial wash 50ml FREE*! Buy Php1,200 (net of dealer discount) worth of Human Nature assorted products and get your choice of facial wash 50ml FREE*! Special Offer 3: Free Moringa Toner! Buy any 2 Hydrating Facial Toner 100ml or Balancing Facial Toner 100ml or a combination of both and get Moringa Toner 100ml FREE! Buy Php1,500 (net of dealer discount) worth of Human Nature assorted products and get Moringa Toner 100ml FREE! Promo Duration: March 1 to 7, 2011 or until stocks last. Before pursing those lips, think about it, is it really just a simple innocent smooch or is it a deadly toxic smack? We all know of and are familiar with the dangers of lead in our lipsticks but did you know that there's also one other thing we should be avoiding? Lake dyes. Lake dyes are the most common synthetic colors used in cosmetics and are called FD&C colors. They are water-insoluble chemical additives that alter a colour of an item and can be neurotoxic. FD&C colors are derived from coal tar, which in turn is a by-product of petroleum. According to studies, lake colours derived from coal tar can trigger allergic reactions, nausea, mood swings, headaches and fatigue. Because some coal tar dyes have been known to cause cancer, they are regulated by the FDA and are banned in cosmetics in the European Union. Thankfully, Human Nature uses absolutely no lake dyes in any of our Love Minerals products. 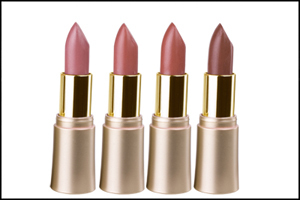 In order to get beautiful shades for our Passion Fruit Hydrating Mineral Lipstick, Human Nature uses iron oxide, a natural alternative to deliver beautiful hues from browns to neutrals to peaches and corals to mauves. So what are you waiting for? Get your own Love Minerals Passion Fruit Hydrating Mineral Lipstick! Not only will you be doing yourself a favour by getting rid of all the nasty chemicals but you'll also be supporting our latest campaign, CommPassion - building a dream for a GK passion fruit farming community in Davao (more details to follow next month!). Make it a habit. Say no to plastic! 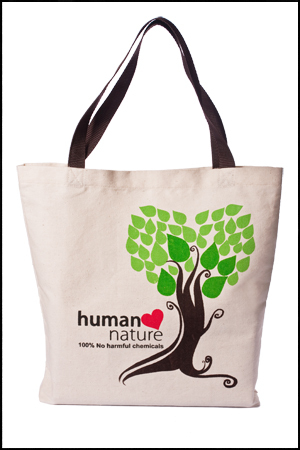 Starting Wednesday next week and for all Wednesdays to come, Human Nature will not be giving paper bags (for free) for products bought in the store. 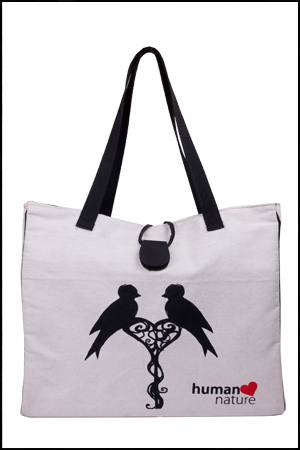 This is in line with our vision of encouraging everyone to BYOB, Bring Your Own Bag! ☺ Let's all do our part and help contribute in saving our planet. Angelo "Jong" Noriel is the newest addition to the Social Enterprise Development Team, bringing in the necessary science to the work of nation building. He finished Agriculture from Visayas State University and was a regional finalist for the Ten Outstanding Students of the Philippines in 2007. Jong is also a member of Youth for Christ and has been an active Gawad Kalinga volunteer since his college days. Currently working as the Junior Manager for SmartSystems Corp. aside from being a freelance writer for magazines on lifestyle & wellness and being a culture & wellness blogger, Kumi's first encounter with Human Nature was what she describes as an orchestrated accident. The first Human Nature product Kumi got to try was the Mandarin Gel Sanitizer that her sister got from a bazaar. A revelation came when for the first time she got hold of a Human Nature catalogue lying around their house. She checked it out and she was so happy that she finally knew more about Human Nature. The products all seemed so interesting and she wanted to try everything! It became completely reasonable for her to do so because she keeps a beauty and wellness blog. Although Kumi wasn't a natural or organic product user before Human Nature, she had been a mineral make-up lover for so long so upon hearing about the Love Minerals line, she was beyond delighted. One of her favourite products is the Sunflower Cleansing Oil. Here's what she has to say about it, "I'm so happy and satisfied with Love Minerals especially the Sunflower Cleansing Oil which to a beauty blogger like me is heaven-sent. It's so effective in removing the most stubborn of all make-up! 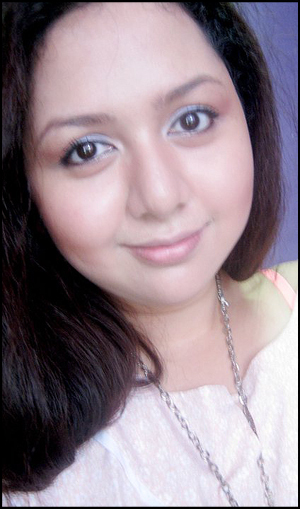 But what I admire the most about the product is its being dual-purpose despite its very gentle formulation. I use it as a massage oil for the face, make-up remover and moisturizer at night. 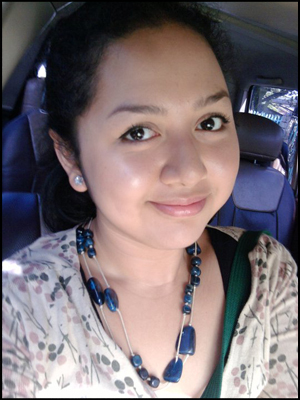 To me, sleeping with a thoroughly cleaned face is very important because I always use make-up especially when I'm road-testing a product for www.lovingsunshine.com. Human Nature Sunflower Cleansing Oil makes my tedious daily thorough cleansing regimen a lot easier and worthwhile." Kumi shares her reviews, thoughts and personal experiences with Human Nature products on her site, www.lovingsunshine.com so do check it out! please read the online version.